JLU’s Global Immersion Programme (JLU-GIP) is an innovative platform for exchange & experiential education, wherein JLU in academic collaboration with world's top universities runs an in-depth but stimulating summer programmes that gives students the chance to increase their academic standing in few of the most vibrant and culturally enriched cities in the world on multiple subjects offered. 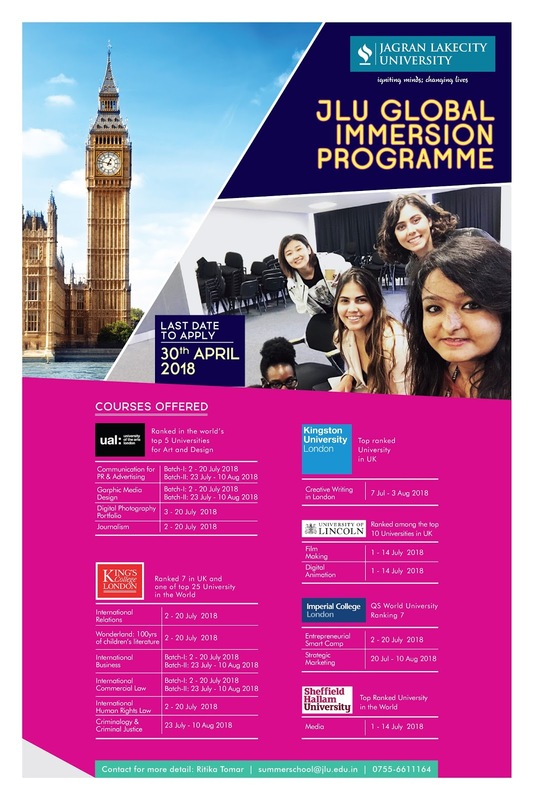 The JLU Global Immersion Programme are 2-3 week long intensive modules delivered at JLU Global Partners in field of Management, Entrepreneurship , Engineering, Literature, Arts, Design, Law Advertising and Journalism. These programs are a perfect way to gain global exposure and our taught by globally renowned faculties to meet the challenges accordingly. These programmes are designed to broaden your international exposure by discovering new cultures and environment. In a world that has grown ever smaller in the wake of globalization, international experience is needed more than ever. These global exposures help to lay a foundation for your future career. Gaining experience will help you expand your horizons and open up mind academically and culturally to meet the challenges of today’s world. One of the primary social and happy benefits of going on a global immersion programmes is that it enables you to meet new people and make lots of new friends. The residential nature of global summer schools allows you to get to know your fellow students both in the classroom and outside it resulting in a cosmopolitan environment and friendships formed with people of many nationalities. The JLU Global Immersion Programmes are a lot of fun. A setting is made in which even the reserved and self-conscious students are able to speak out and offer ideas and opinions to a group discussion and will relish in the socializing as well Mixing with peers from all walks of life and multiple nationalities, you’ll learn to interact with people from different backgrounds, and you’ll develop confidence just from being away from home in a completely new country.